Mr. Bahl has over 20 years of experience in consulting / financial services in the U.S.A. and India with a significant track record in mid-market Investment Banking. Formerly he was also served as Country Head of Thomson Financial (New York) and Country Head (India). Samir is a Post Graduate in Business Administration from University of Rochester's Simon School of Business Administration. Dr. Gujral has than 12 years of experience in the life-sciences; primarily in corporate strategy, management consulting and operations. He has formerly served as the Head of consulting & Principal for Clearstate Advisory in Singapore, having served in senior leadership positions with Apollo Hospitals & Fortis Healthcare. He is a Double Post Graduate Doctor of Medicine (MBBS, PGDPPHC, PGDMLS) and an MBA from ISB, Hyderabad. Anil has over 10 years of experience in leading U.S.-India cross border commercial and economic/financial sector policy engagements. He has been the Senior Advisor for India to US Treasury Secretary Timothy Geithner and was formerly the Business Development Manager, Corning Inc. He educational qualifications are: Economics degree, UCLA; Masters degree, Harvard University Law degree, University of Arizona. Sachin has spent over 9 years in the equity capital markets and Investment Banking. Prior to joining AnandRathi, he served at Ambit Corporate Finance and Karvy Investor Services Limited. He holds an MBA, IIPM Mumbai. Mr. Rao has been involved in Investment Banking for over 7 years. He has handled various transactions including IPOs, Rights, QIPs across varied sectors such as Apparels, Consumer Electronics, Renewable Energy, Healthcare and Industrials. 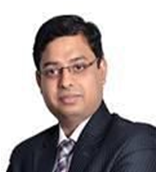 Bharat has more than 7 years of experience in the financial services industry. He has advised and executed various transactions in the consumer & retail sector. He has formerly served into Financial advisory at HSBC. He holds an MBA - ISB Hyderabad and Bachelors from Shri Ram College (SRCC), Delhi University. Ganesh has spent over 10 years in Investment Banking, having previously served with Axis Capital Limited (erstwhile ENAM Securities) and Prime Securities Limited. His diverse experience ranges across Infrastructure, Pharmaceuticals, Healthcare, Textiles, Brands & Apparel, Education and Agricultural Commodities, having worked across the product spectrum including Private Equity, IPOs, QIPs, Business Restructuring, Structured Debt, etc. He is a Chartered Accountant. Amol's has a rich experience of over 10 years spread across Investment Banking, Capital Markets and PE syndication across core infrastructure, construction and logistics sector. He has worked on over 15 transactions with a cumulative deal value of USD 2.5 bn. He has previously worked with Investment Banking teams of JM Financial and o3 Capital. Amol is a Chartered Accountant. Vipin experience in Investment Banking spans over 7 years He has handled transactions across IB products including M&A (Cross border and domestic), Private equity and equity capital market products in various geographies including Japan, Indonesia, China and Australia. Formerly he served at XYKno Capital, Credit Suisse and Sutherland Global (erstwhile Adventity) Vipin holds an MBA, IMDR, Pune.